Tapped Reality addresses how our constant and expected access to the internet and television allows us to tap into new ideas -- including ideas that confirm and validate our existing sense of reality, for better or worse. The wall explores how access to this constant source of self-affirming data hardens our perspectives. 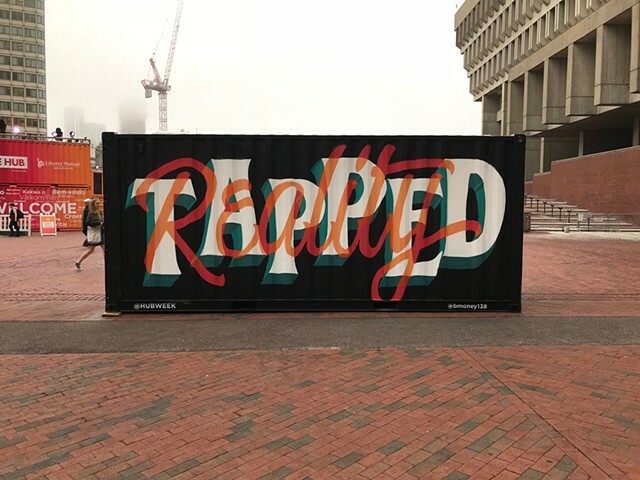 Denahy explores typography as public art as his work varies in scale from large typographic murals to smaller commercial signs, all of which remain focused on using typography to tell a story. In a time where the visual landscape is dominated by mundane, cookie-cutter, perfectly precise computer generated fonts and images, Denahy’s work brings thoughtful, creative, handcrafted letterforms back into the public sphere.